I was a bit shut out from social media storytelling when we moved to China without a VPN service. After I got reconnected, I realized how fast the world is moving and how many people create a personal brand. People all over the world, including me, have been connecting and sharing their stories through photos, videos, music, and blogs. 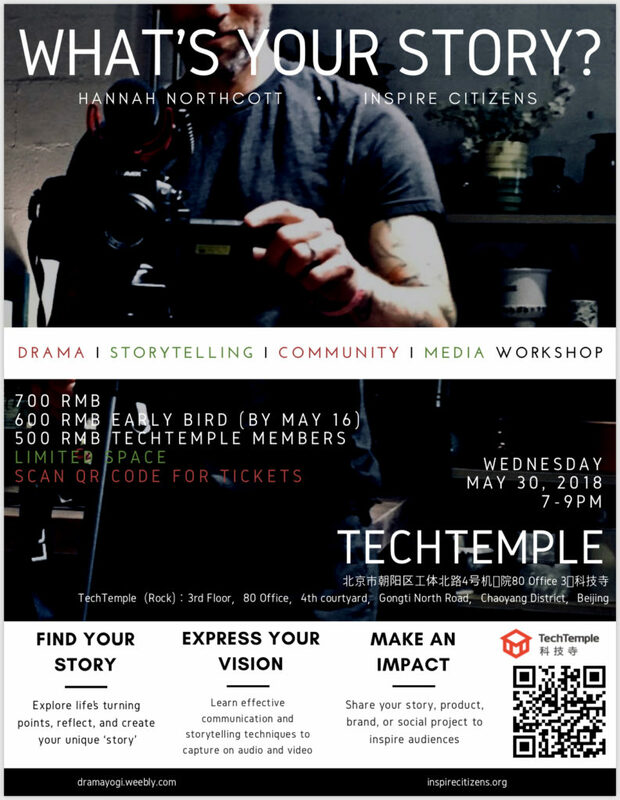 This Wednesday (May 30), Hannah Northcott and Steve Sostak from Inspire Citizens are holding the workshop, “What is Your Story.” Northcott is a woman of all trades: she is a yogi, teaches drama in middle school, a mother, and a fitness advocate who has over 100 women in Beijing getting fit. Sostak is the co-director of Inspire Citizens and runs workshops; and consults and coaches through community action. He has toured the globe as a saxophonist and performer. He has taught literacy and sustainability and used those topics to promote sustainable thinking in classrooms and communities. “What’s Your Story” combines the fast amount of knowledge Northcott and Sostak have, in which they will help attendees create a great backdrop to their stories. This workshop is almost sold out but a little birdie told me that more of these special workshops will be held soon. The workshop will be held at Tech Temple in Sanlitun, a co-working community and a co-working space. I can’t wait to hear people’s stories. Sign up through the QR code on the poster.